Did you ever, as a know-nothing kid, push against your closed eyelids for the pleasure of the resultant light show? 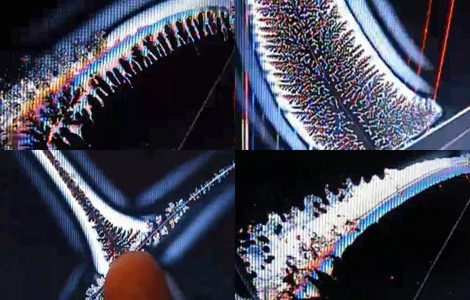 LCD bending takes the low-tech fun of physical retinal stimulation and updates it for the 21st century. And, as the title suggests, the end result looks very much like a sort of angelic, fractal-based fingerpainting. Unlike circuit bending, LCD bending doesn't require much in the way of preparatory work: If you've got a cracked-but-semifunctional LCD screen, appendages with which to push and—for good measure—enough knowledge about consumer electronics to avoid electrocuting yourself, you, too, can create interactive digital art of the sort featured in the pictures above and video below. I'm such a geek, this is making me go wtf. But they probably broke it by accident before hand.